Shown here on the Pierson door style in Maple. Ivory Cream is a Tinted Varnish  nish. Shown here on the Tempe door style in Oak. Ivory Cream is a Tinted Varnish  nish. Shown here on the Augustine door style in Maple. Ivory Cream with Chocolate glaze is a Tinted Varnish with Glaze  nish. 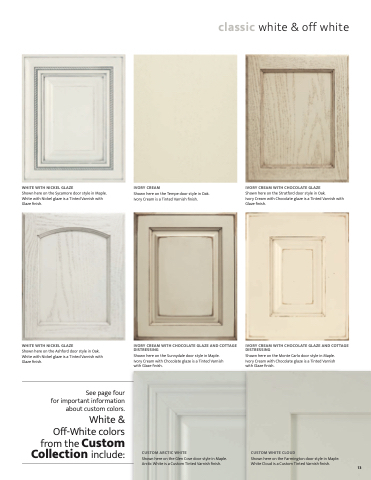 Shown here on the Gulfport door style in Maple. Ivory Cream with Latté glaze is a Tinted Varnish with Glaze  nish. Shown here on the Ridgeway door style in Maple. Ivory Cream with Bronze glaze is a Tinted Varnish with Glaze  nish. Shown here on the Stratford door style in Oak. Ivory Cream with Chocolate glaze is a Tinted Varnish with Glaze  nish. Shown here on the Paci c Grove door style in Maple. Ivory Cream with Nickel glaze is a Tinted Varnish with Glaze  nish.